the first five or ten times, but the 97th time? Ugh. about books is perfectly fine. Then there are those other books, the wonderful ones, which you still love, even after seemingly hundreds of readings. Have you discovered Blueberries for Sal *, Owl Moon , or Elephant and Piggie books? I’m happy to read and re-read these stories.There are some fantastic less-well-known books too. I’m sure you have a few favorites yourself. Mine include Nora’s Chicks and Tiptoe Joe, which I wrote entire posts around (HERE and HERE). How did you find your favorites? Did you choose them deliberately, or stumble onto them? How do you know, when you’re thinking of buying your kids a new book, whether it will be eternally pleasing or ultimately annoying? 1. Start with what you already like. 3. Check out award winners. Caldecott books are a great starting place for fantastic titles that stand the test of time. likely to become a favorite with you as well as your kids. 5. Illustrations set the mood. If you love how the book looks, it adds another level of enjoyment to the experience. whistle long and low like a sad, sad song” and a night “as quiet as a dream” makes me feel mellow and happy. 7. Rhythm moves you. When a book has an easy flow and rhythm, it’s pleasant to read aloud. It doesn’t have to rhyme to have a satisfying pace, but some of my favorites do rhyme, such as Sandra Boynton’s board books . 8. Don’t confuse Early Readers with Picture Books. Early Readers (like Dr. Seuss) are accurately named, and they have their place. They’re meant to be read by children, not adults. You may need to read them a few times, until your non-readers memorize them and begin to “read” them to you. If your kids aren’t at that stage yet, then sneak it up to the high shelf until they’re ready. 9. Symmetry is pleasing, but watch out for too much repetition. When a story has parts that are symmetrical, like Little Sal and Little Bear in Blueberries for Sal , the story can engage your adult brain and feel satisfying. you find something that tickles your funny bone, you may have a winner. Of course, Murphy’s Law means that your children aren’t going to love every book you do. And Aunt Ethel will give them a completely annoying book that they love. Go with it — at least the first 96 times. *Books and Giggles is a participant in the Amazon Services LLC Associates Program, an affiliate advertising program designed to provide a means for sites to earn advertising fees by advertising and linking to amazon.com. Count yourself lucky. Mine find favorites. Even with library books, they want the same story every day for the whole two weeks. I go along if I like it too. Otherwise, I start suggesting alternatives! Great post! I'll definitely be taking a few of these tips on board. Two of my favourites, that I don't mind reading repeatedly when my children request them for the twenty hundredth time are "We're Going on a Bear Hunt" and "Green eggs and Ham". However, there are some that I've read so often that just the title being mentioned sends my head spinning! I love to read aloud – as long as the story isn't annoying! I definitely agree that illustrations, rhythm, storyline and language make a huge difference. We have a ton of favorites, and I look forward to checking for Nora's Chicks and Tiptoe Joe at our library. I hope you enjoy them as much as we do. We first discovered Nora's Chicks at the library and liked it so much I bought a copy for us, plus two for gifts! Thank you for the tips, I've been looking to expand our collection! Good tips! I try to buy the most indestructible books I can find 😉 Board books are our friends! Good tips. I like Julia Donaldsons books as they are rhyming and very easy to read and enjoy…my children like them too. As a former early childhood educator, I can honestly say I'm obsessed with children's books. There's nothing like finding a great book that has impact with kids. I love Mo Willems!! One of my favourite authors. Oh I almost forgot… thanks for linking up to the #SHINEbloghop! Great post. For the past few months I've been trying a new strategy picking out pictures books: grab 10 random ones off a shelf without looking at the titles until we get home. We've found a few good ones that way, but mostly not. At least it keeps things interesting. I am a big child myself and I LOVE reading children's book just as much as my kids. Great article, thank you for the tips. Thanks for the link. I'll check it out! Wow — what a great list! I see a lot of favorites plus quite a few I've never heard of — always a good mix for a "best books" list. Thanks again. Thanks for these great tips! It's always a shame when the kids don't like the books you've brought home. 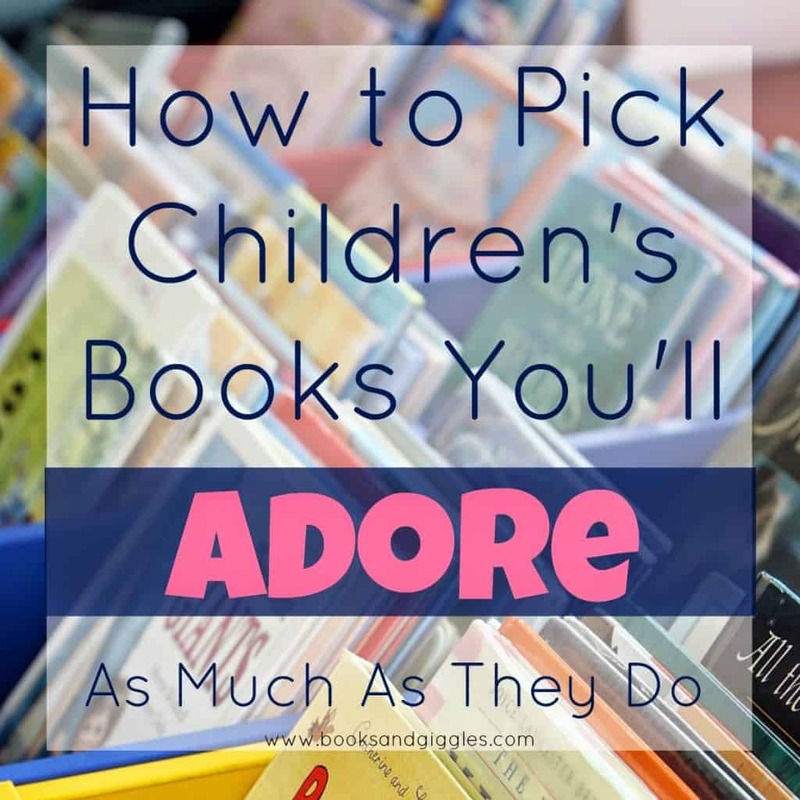 I also found Kathleen Odeon's Great Books for Boys and Great Books for Girls to be a great resource … we read most of the picture books to great reviews by my kids! Thanks for your tip! I just requested Great Books for Girls from my library. We have great book addicts in our house as well as one reluctant reader. I love your tips.